As I've greatly increased my event appearances the past twelve months (14 events in 12 months), I have had to pull back somewhere, and one place has been on my work for Every Day Original. Now starting my fourth year with them, I am down to quarterly entries. This is my entry for summer. One thing I greatly value about my work for EDO is the often spontaneous nature of what I produce for them. As well, as the work is meant to be on the more affordable side ($500 or less), it tends to be smaller. This affords me the opportunity try new things, experiment with ideas or media. My work there while not consisting of Major Works, have nevertheless been some of the more important things I've done in these four years, primarily as regards my figurative and more gallery-type of work. So it goes with this entry. It posted today, a Thursday, but as of Monday I had no idea what I was going to do for this entry. I had started working on a small concept for a fantasy illustration type painting the week prior, but wasn't convinced enough to pursue it, so I just let the ideas stew over the weekend, and then when the concept came to me while working on another project, on Monday, I switched tracks and took Tuesday and Wednesday to create it. As such, it was displayed fresh from the oven, as it were. Working from the hip like this is exhilarating and a little scary. Having to make quick decisions and then commit to them is dangerous for client work, but here I was able to make these sorts of choices. 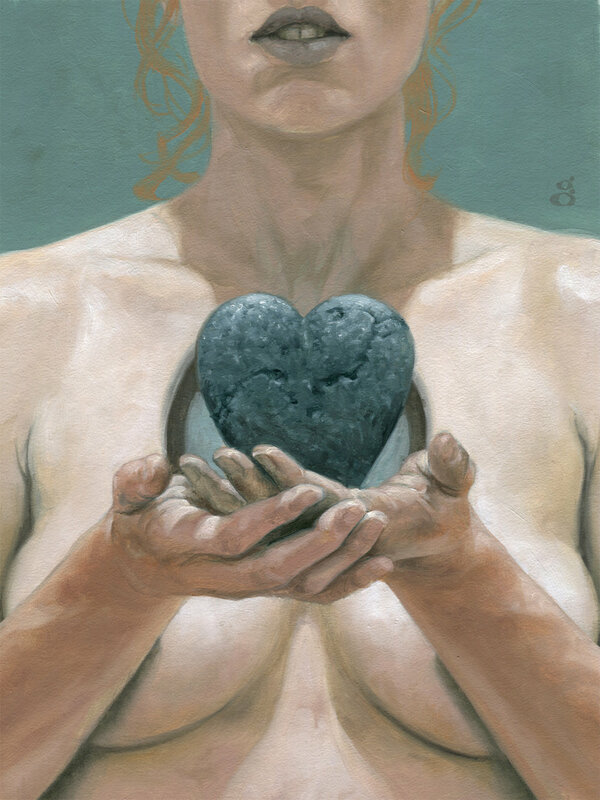 So, early on I had conceived of the heart being held here as being a more anatomical heart rendered as stone. I had painted it up and would have continued a bit more after it had dried. After going out for a long jog, I came back Tuesday night and with the paint still wet, repainted it into the symbolic shape instead. I felt it wasn't reading clear enough and was also a little gross. I paused on a client's project to create this, and just as soon as I started, it seems, I finished this and am now back to that illustration! "Sklerokardia" is available at Every Day Original, starting on Thursday June 28th.